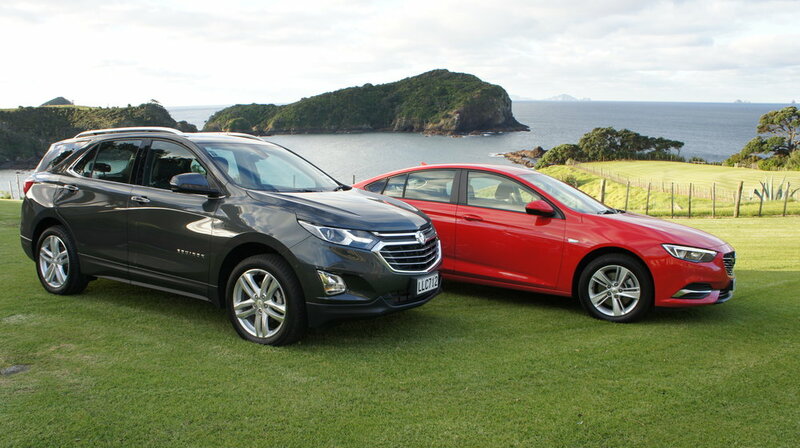 Holden’s Commodore and Equinox have yet to come up to speed in petrol form. Will the diesel editions razz up their sales potential? LIGHT and measured throttle movements, minimalizing braking, keeping the revs down and, ahem, pumping up the tyres (well, they never said we couldn’t). With that, a challenge laid down by Holden New Zealand to spice up the media introduction to their latest diesel models was met. Yes, it was possible to beat the official cited optimal fuel economies for the compression ignition editions of the Equinox and Commodore, while driving carefully yet without entertaining the hypermiling measures that are employed when real records are at stake. And the winner was? Well, the Commodore in particular, but not in my hands. Not quite. Even though I thought my feat of 4.9 litres per 100km average from taking the LT hatch from Holden NZ headquarters in Mangere East to Tutukaka was pretty nifty at 0.7L/100 beneath the official cited count, I was pipped by a colleague who somehow enabled a 4.7L/100km outcome. When we ran a 200kms’ course back to base next day, I also thought I’d done well to achieve 5.5L/100kms from the Equinox LTZ-V, even though that return was just 0.4L/100km under the maker’s own figure. Yet, again, my colleague managed to repeat his 0.2L/100km margin. I can only guess that, whereas I thought 40Psi was quite enough, he was braver still when nipping off to a petrol station air compressor. Either that, or maybe there are a couple of brand-new spare tyres and tool kits sitting somewhere on the route. Anyway, the exercise delivered a fun element to what would likely have otherwise been, with a prescribed route mainly sticking to State Highway One, a bit of a dull run. It also provided a good reminder to anyone interested that diesels are the best engines to choose if you’re into saving driving dollars while on the move. But there’s the thing. Who exactly IS interested? That’s probably a safe call. As Holden points out, there has indeed been a significant rising interest in diesel cars and SUVs over the past few years, and with 16,634 candidate vehicles being registered here year to date, 2017 could deliver the biggest crop ever. But that’s when looking at the overall scene. Start dissecting the various sectors and, despite the massive lift in growth for anything vaguely off-roaderish, it’s still a story of advance and retreat. The compact crossover category where the Equinox is placed is intriguing. Yes, it’s a boom spot. Yet others brands contesting this arena have been telling us over the past 18 months that buyer interest is diverting back toward petrol engines. A preference Equinox has been seeking to meet since January. It’s great to finally see a Commodore diesel. But is the party over? That Holden here does not choose to cite any rivals is not surprising. Fact is, a car that would have been considered just the right thing 10 years ago has landed when the diesel car party is pretty much over. There are now very few sub-$70,000 direct candidates left to nominate. Most have been pulled from market, their distributors having decided that various factors – from distaste for Road User Charge and negative perception about servicing cost and frequency to distrust emanating from the Volkswagen emissions scandal (even though nothing the brand did transgressed our regs) – are just too challenging now. Yet even if market trend is such that some might wonder why Holden is bothering at all (actually, I did ask, but they preferred not to take the bait), on the other hand, what’s to lose? Even if the diesel variants – two in the Commodore, a $48,990 LT hatch and $50,990 sportwagon, and three with Equinox (which, with no LS grade available with this engine, kicks off at $46,990 LT and spans $55,990 LTZ and $59,990 LTZ-V) – add but a few more extra registrations to the monthly counts, that won’t be considered a waste. Industry data released just the day before the July 4 launch event reinforces that while Holden is the country’s third best-performing brand year-to-date, the Equinox and ZB Commodore are not yet contributing massively. Just 390 Equinox sales over a six month span is not a brilliant performance, least of all when the best of its rivals – Toyota RAV4 and Mazda CX-5 especially – rode high within last month’s top 15 passenger choices. Commodore has accrued 936 registrations within that period, which outwardly looks far more respectable. Yet it seems the VF range which curtailed when Holden ended car-making in Australia last October has factored significantly. (again including some VFs). But since it hasn’t done so well: 102 in April, 119 in May and 96 last month, out of which almost a third went to ‘Government fleet’ (the police patrol car contract). What potential, then, for the four-cylinder turbocharged diesel units coming to the rescue? Abiding impression from this first try-out was twofold. First, it reminds that two model lines cruising in a similar pricing zone are patently developed to meet different levels of expectation. Holden’s assertion that the Commodore, at entry LT spec, is more for fleet while the crossover is, across all trims (and only the flagship was available to try) is family-oriented is fair. The cloth trim says as much. Yet even with a work-first ambience, it nonetheless stands out as being the more cultured, better cultivated opportunity of the two. Simply put, Opel’s design, engineering, equipment provision and assembly approach reflects a higher level of final touch commitment. The second point is that, given both units carry a $3000 premium, it’s a pity real General Motors hadn’t managed a two-for-one drivetrain deal, favouring Opel’s choice. It’s more advanced– though both require AdBlue, the larger unit alone meets Euro6, one step above the 1.6 – and is more satisfying. Slotting the 125kW/400Nm engine and manual shift eight-speed auto that Commodore carries into Equinox as well might also have been seen to be more sensible given that many rivals it faces up to tend to provision at this level. Asking if the 100kW/320Nm 1.6 and six-speed gearbox Equinox instead carries is enough to make it a credible class contender is a truly relevant question. Holden, for its part, merely says the Commodore hardware was not available to the taller car, so that’s that. However, it’s a slightly odd thing for the diesel choice to not just be the family leader for thrift (which it is) but also torque – but it doesn’t. The top Equinox 2.0-litre petrol trumps with a 353Nm output. Anyway, from our experience, the Commodore definitely has a much easier time asserting its driver appeal. That it patently has not only more muscle exerted over a broader spread – the peak loading up from 1750rpm to 2500rpm (against 2000-2250rpm in Equinox) - and greater immediacy is obvious, of course, but it’s also the sweetness of this ZB’s refinement that really stands out. Diesel rattle at idle is always unavoidable, but it’s really not too bad here. We were reminded before the drive that Opel had made refinement an absolute priority. It’s not idle boast. They’ve really done a great job. In cruising mode, however, this ZB is potentially not a lot less resonant than the petrol alternates; the biggest difference is that the timbre is deeper even than the V6’s. This, and an easy-going muscularity when heading up hills and scything through corners, suggest the Commodore has the right engine for the work ahead. Can the same be said of the 1.6? Asking an engine that has less to give and more to haul – 1730kg versus the ZB’s almost svelte 1593kg – delivers an unavoidable outcome. No surprise that kick off lacks the same kind of alacrity that ZB drivers will enjoy demonstrating or that it tends to speak more gruffly and more loudly at any speed beyond, mainly because it is clearly having to work harder for the most part. This trait, the more limited ratio set and an outright hand-shifting procedure straightaway all put the Equinox on a back foot in the hunt for extra thrift, regardless that the driving approach was much of a muchness: Feather foot and no sudden moves. One advantage with Commodore is its better suite of instruments for this kind of driving, not least an eco gauge that consistently updates instant and average burn and also shows, by way of an idiot-proof display, when you’re overdoing it. It was this that revealed something you’d think would be illogical: that hauling up a hill hand-holding the box in fifth or sixth and pulling 2000rpm was producing less fuel burn than letting it lug up in Drive at barely half that on the tacho. Not that it cries out for this interaction. A colleague proved as much through having undertaken the drive without any thought to economy; meaning air con on, a heavier foot, more abrupt braking … and he still beat the manufacturer claimed optimal. Only fractionally, mind, but even so. Sense that the Commodore is the smarter car reaches to how it acquits in every area, frankly. Whatever sentiment lingers about abdication from V8 and rear-drive – or steering into the diesel arena, for that matter – you cannot deny that the ZB is a thoroughly modern and, overall, pretty well sorted car, one whose dynamics gather even more polish from Holden involvement. Those same ride-handling people have also undoubtedly done a good job in making Equinox a better drive here than it probably is back in North America. Yet this product just doesn’t anything like the same pizzazz in respect to what it does and how it does it. The biggest cross it has to bear remains one I raised when the petrol editions were revealed to us last November. It’s a new car that looks older, and more awkward, than many alternates. At least it has roominess, comfort and a far from sparse specification on its side. The diesel models replicate their petrol siblings specification; so heated front seats, embedded sat-nav (whereas ZB replies on Apple CarPlay/Android Auto), remote engine start and front park assist as standard. One-touch folding rear seats and four USB charge points throughout the vehicle are also highlighted by the brand. The LTZ steps up to 19 inch alloys, LED headlamps and tail lamps, hands-free power tailgate, rain-sensing wipers, wireless phone charging, front and rear seat heating topped off with a Bose premium audio system. The LTZ-V adds in a two-panel panoramic sunroof, power passenger seat, ventilated front seats and heated steering wheel. Advanced driver-assist safety technologies extend to forward collision warning, low-speed autonomous emergency braking, lane departure warning, lane-keep assist, blind-spot monitoring, rear cross-traffic alert, high-beam assist, cruise control, rear parking sensors and a reversing camera. Commodore also ticks the most relevant boxes, too, and also aces as a spacious opportunity. The challenge it faces is simply being noticed: If the petrol editions are not getting the attention they deserve, how much harder will it be for the diesel? As is, you wonder if Holden’s product planners are not already ruing the one opportunity that chose not to follow up on when determining their model lineup: Namely, an elevated diesel four-wheel-drive wagon to sit alongside, or perhaps below, their V6 Touring. Given that just this configuration exists in this car in right-hand-drive, albeit in its a Vauxhall Insignia alter ego, and taking into account the obvious interest Kiwis are showing in versatile and sensible soft-roaders, you’d think Holden would be investigating the potential. Sadly, those locally representing the Aussie arm of the business say there are no plans for this kind of car here.